As in the case of dc current gain, two parameter symbols are available for common-emitter ac current gain; βac and hfe. Either symbol may be used, but, once again, hfe is the symbol employed on transistor data sheets. Refer to the circuit in Fig. 4-17(a) and assume that the transistor (Q1) has βdc = 50. Note that the 0.7 V dc voltage source (VB) forward biases the transistor base-emitter junction. An ac signal source (υi) in series with VB provides a ± 20 mV input voltage. The transistor collector is connected to a 20 V dc voltage source (VCC) via the 12 kΩ collector resistor (R1). The VC and IC levels are shown on Fig. 4-17(a). While the ac input voltage (υi) is zero, the transistor collector voltage remains at 8 V. When υi causes a base voltage variation (ΔVB) of ±20 mV, the base current changes by ±5 μA, as shown in Fig. 4-17(b). 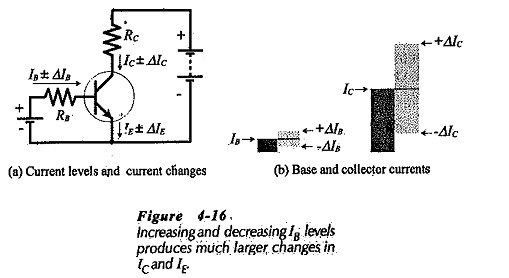 The IB change produces a collector current change. 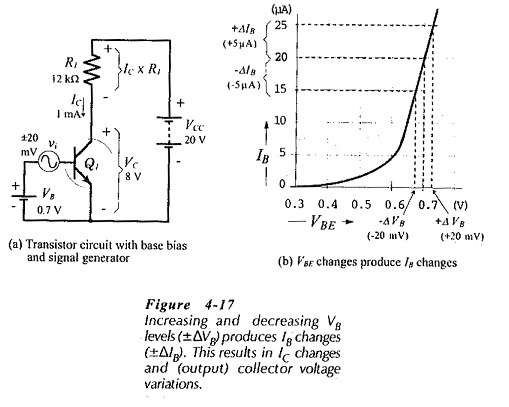 Figure 4-18(a) shows that ΔIC causes a change in the voltage drop across R1, and thus produces a variation in the transistor collector voltage. The circuit ac input is the base voltage change (ΔVB), and the ac output is the collector voltage change (ΔVC). 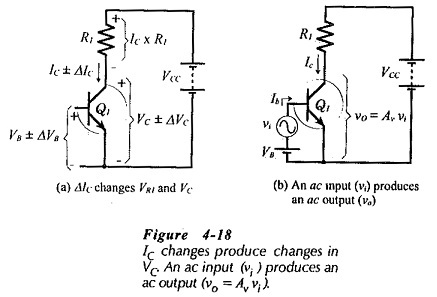 Because the output is greater than the input, the circuit has a voltage gain; it is a voltage amplifier. The voltage gain (Aυ) is the ratio of the output voltage to the input voltage. Substituting the ac quantities for Fig. 4-17(a) into Eq. 4-8 gives Aυ = 150 once again.